The wait for this year's Cup was borderline ridiculous... but it has finally come out! The most anticipated and highest priced hockey product is now upon us. 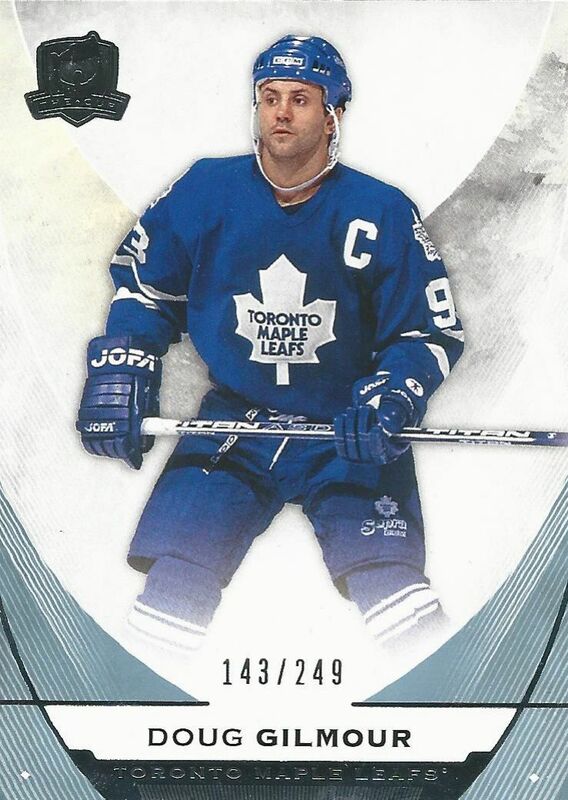 It should come packed with the absolute best cards that a hockey card collector could ever want. With a price tag of nearly $800 upon release, each tin better deliver something special. I wonder if anyone really cares about Cup base cards. They were once pretty highly sought after and collectible, but in the collecting environment today, they are pretty much an afterthought. Each base card comes with The Cup's extremely thick card stock, and each card is numbered to 249. I guess 249 is a low number, but not that low. Anybody who wants to get their favorite player's Cup card won't be hurting to find it, or afford it. As always, the Cup base cards have a clean and modern design. It certainly looks classy, but at the cost of being interesting. I suppose Upper Deck is going for elegance, but why does it have to be so boring? I won't knock the cards for looking bad, but I wish the cards were more exciting. The tin I opened came with two base cards, so I guess you could say I was doubly un-excited with them. The back of the base card is also very typical of how Cup cards have been designed in the past. Again, not a whole lot of frills on the back, but the back is clean and implemented well. The stats are easy to read and have a nice large font. It has all the relevant information that the back should have. Sadly, there is nothing to read in terms of player text on the back of the Cup. It's mostly just numbers. 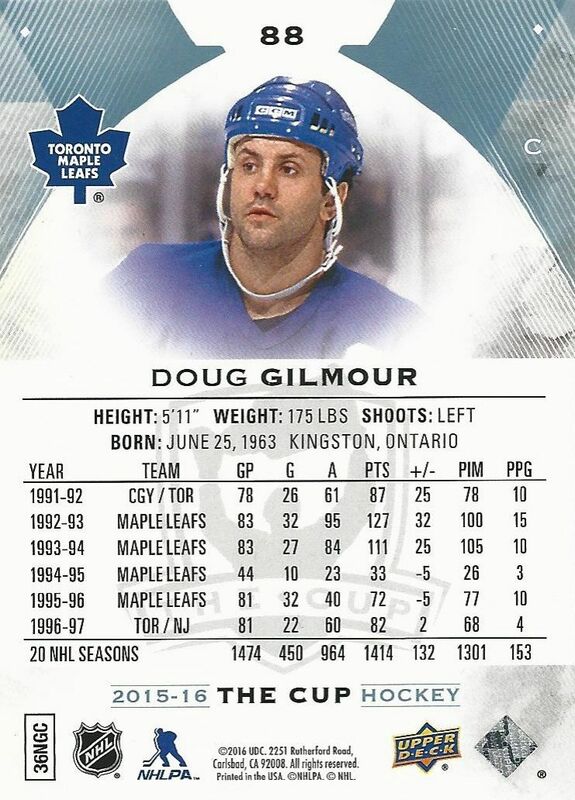 A player's most expensive rookie card is usually found in The Cup. Most players are numbered to 249, like the Charles Hudon I pulled, but the top tier guys are limited to just 99. 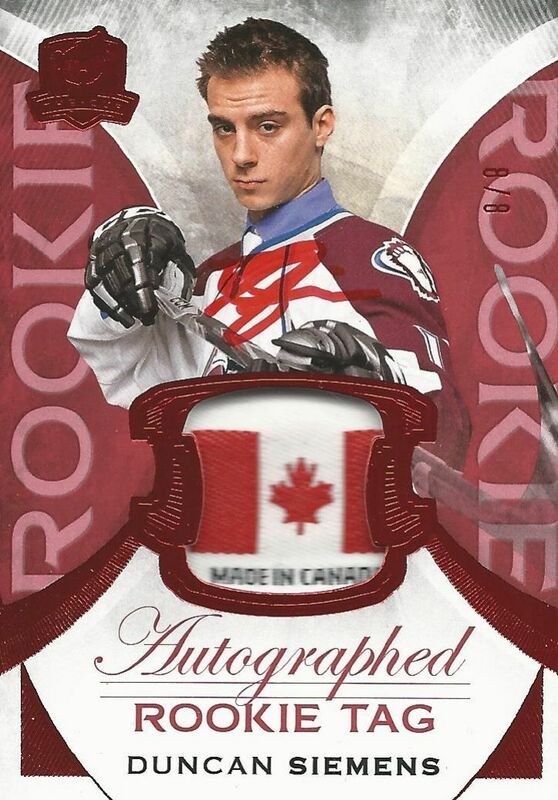 Each rookie card features an event-used patch as well as a hard-signed autograph. The rookie cards this year have a similar look to the base, but definitely take it several notches up. The foil used and the overall design elements come together and fill out the card. Rather than being stale, these cards have an elegant and exciting look to them. These rookie cards will no doubt be huge draws for collectors looking for their favorite rookies this year. This is where The Cup shines. When a collectors purchases a tin of the Cup, they expect to get some really nice hits. The Cup is full of game-used material and autographs. Though my tin had 2 base cards in it, I was still able to fish out four hits - two of which I thought were particularly nice. Though the Cup is very expensive, lucky collectors who find autographed Connor McDavid cards will have at least made back, if not exceeded, the money they put into a tin. 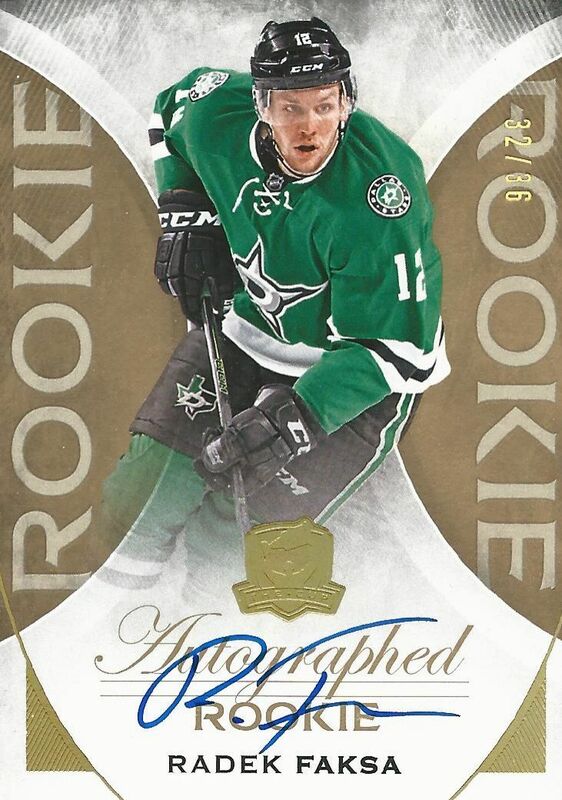 My most lackluster card from my tin had to be this Radek Faksa gold parallel rookie card numbered to 36. It's basically the rookie design done with gold touches minus the most important part... the patch! I supposed this is a way for Upper Deck to add additional rookie content to the product, but unless you're getting a top rookie from this year's class, this type of card isn't too exciting to get. Now this is a lot better! Though it's another rookie card parallel, having a tag patch on the card is pretty awesome. This card is numbered to 8 - which is a little high in my opinion - but features a piece of the tag on the jersey that Duncan Siemens wore. The red foil on the card really makes the card stand out and really goes well with the Canada Flag patch. I've seen one other from the 8 copies of this card on eBay, and it didn't have the flag portion of the patch, so I'm guessing this may be the best one of the 8! I thought the Siemens flag patch was my pack hit, but I was wrong (thankfully)! My best card from the break was the letter 'E' from a GAME-USED nameplate off his jersey. 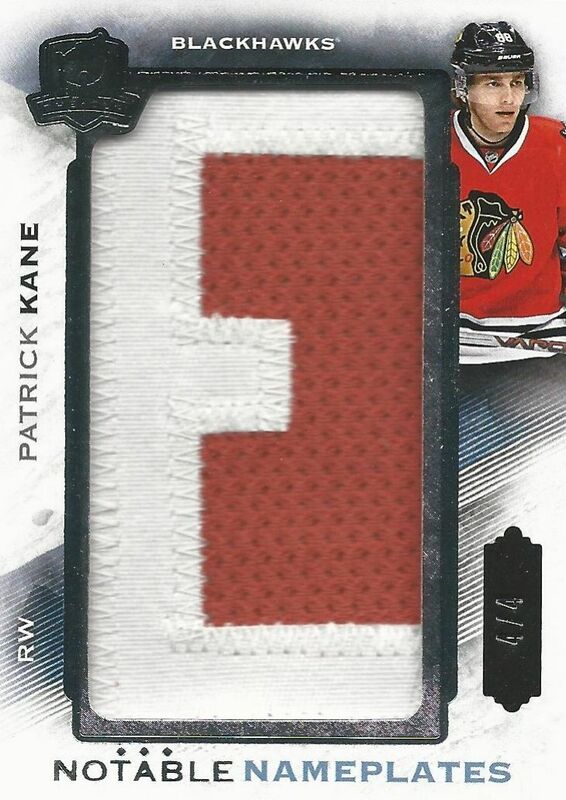 Since Kane only has four letters in his last name, getting one of his Notable Nameplates cards is pretty nice. Kane has also been instrumental in the success the Blackhawks have had over the years so getting this card out of my tin was great. This is the type of nicer pull that I think many collectors really expect out of the Cup. My other hits were rookies, which could potentially be good, but getting a solid hit of a an established star player is always satisfying. This is the only tin of the Cup I'll be breaking this year, but oh how I wish I could open more and find all the amazing treasure trove of cards within it. Upper Deck has book cards, stick cards, and amazing patches to be found here. One tin? It doesn't even scratch the surface of what's available to be found! What can I say? The Cup is The Cup. If you are lucky enough to be able to get a tin, it is an incredible opening experience. The price of this year's Cup is absolutely ridiculous. 99% of collectors cannot afford to get a tin, but plenty of this product will be broken this year as it always is. Much of the cards will be available at decent prices on eBay and other sites. The only cards that may be really out of reach are the Connor McDavid rookies that come out this year. We're looking at thousands of dollars per copy for those particular cards (especially his rookie patch auto numbered to 99). I have to save a lot all year in preparation for the release of the Cup. I guess if the Cup is something you really want to open, it is possible. Just know that many who want to get one will really have to sacrifice and plan on the purchase. Getting the Cup is a huge gamble, so think hard before going for a tin if you're not one of those folk who have the extra money to get a tin or twelve. For me, I like the thrill of busting a tin - it's unlike any other hockey product out there. I go in knowing I probably won't be getting the absolute best card so my expectations are tempered. I find this a good approach to the Cup. So how do I rate this year's Cup? Well, to be honest it all hinges on the rookies (I'm looking at you, Connor!). If McDavid (or another rookie) becomes THE star for the NHL in the coming years, then this year's product will be absolute fire. Prices will not come down and high-end collectors will gobble all of it up. If not... well... then the opposite will happen. But it looks like McDavid will be holding this product up, and the excitement has definitely not died down. I'd say this year's Cup is a winner for now. I really love the cup every year with there hits amd designs. Too bad a box is way out of my price range! Sick Kane and tag auto! Pretty sick Charles Hudson card. Awesome Kane card. Nice box too! I like the design and overall quality, might not be worth the price. Great box and break as usual! Can't wait for more content! very nice cards! A box is way outta my price range but cool to see.. 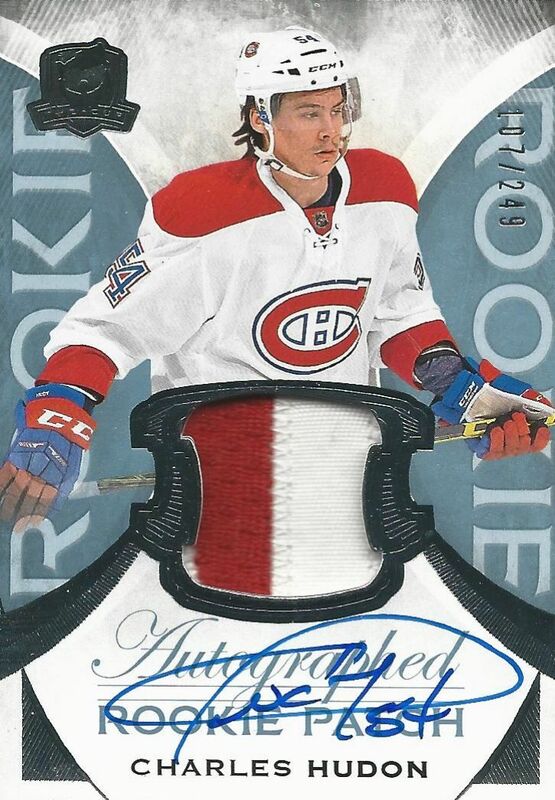 The design of the Rookie Patch Autos were nice and nice Kane card. That Patrick Kane is so nice!!! Congrats!! I'm a big Hawks fan so to me, that's pretty awesome!! Great box!! Luke, thanks for sharing your tin of The Cup! Nice selection of rookies, but what a middle-of-the-break with the tag auto /8 and the Kane Notable Nameplates /4! Love it when anyone scores a game-worn (not the manufactured /~75) nameplate card, and it couldn't have gone to a better collector! Enjoy "Star Wars" x Sharks night at "The Shark Tank" tonight! The giveaway mashup t-shirt looks awesome! The cup is always super nice, but so expensive! I guess most times you get what you pay for with this product though. Nice review. Awesome hit with that Kane nameplate. I love the variations of cards in this box! Really informative review... Sick Kane pull. Nice Canada tag! I like the design of 15-16 the Cup! Still 2 base cards is kind of disappointing. WOO. Quite the product! Love your breaks and reviews! That kane is insane! Nice box. Really nice-looking cards this year, unfortunately the price is rather high to say the least. Awesome Kane and Siemens! nice Hudon, too bad he got hurt so bad. not sure on where you get the $800 price tag though... Cup around here is between $600 and $640 per tin. And that's Canadian. That would be around $450 U.S. The cards were nice especially the tag and the Nameplate. Unfortunately, this box is way out of my prince range. Keep up the good work. Wow! What a great break! These are all awesome cards! Especially the Kane. I hope I could buy a tin, but since I'm a student who doesn't make much, I prefer tu buy a few 100$ box per year then buy only one box even if it's incredible. Great break! Nice Hudon rookie! I love the design this year! I love the tag cards from this set!